I’ve been itching to offer my insights, or lack thereof, into the Mountain Buggy Unirider since the moment I bought it – a device so simple you’ll look at it and say ‘why didn’t I think of that?’ You’ll wonder perhaps, as you look at the pictures of the device, why anyone would be willing to part with any money at all for a device you could cobble together in your garden shed. Here’s the thing, neither you or I thought of it and it took the genius of one man, Simon Langham, to take to his shed and develop the prototype Unirider that, in mass production, under the care of Mountain Buggy, I have come to adore. Let me explain why, if you have an age appropriate child and want to do something brilliant, this device is a no-brainer of a purchase. 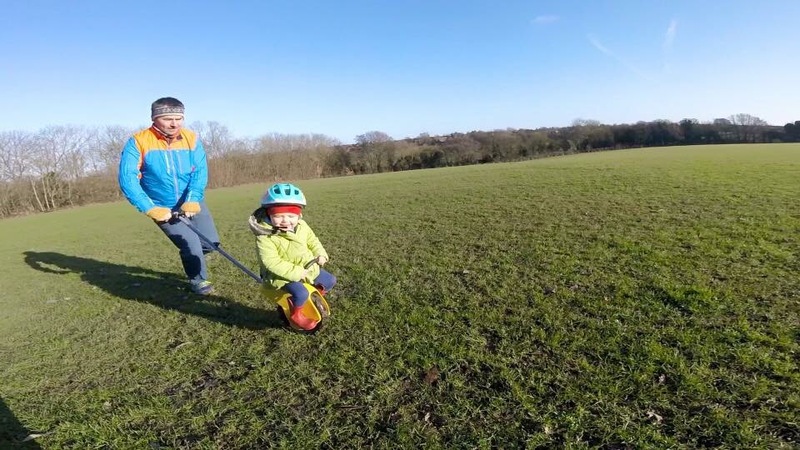 I’ll let Mountain Buggy explain what the Unirider is and then we’ll look at my experience with it since we unfurled it around Kent at Christmas 2016. If you were being unkind you might call it a wheel, seat and stick combination, which in truth it could be argued it is, but it’s so much more than that and you don’t really get it until you open the box and feel it. First impressions: I pretended that this was a gift for UltraBaby but the truth is this was a gift for a running parent who loves getting muddy with his daughter. As I opened it I felt the weight of the plastic and the wheel, and although not massively heavy, had a feeling of quality, durability and security. The bold yellow moulded plastic seat is a design masterpiece. I put together the Unirider is a couple of minutes and offered UltraBaby the opportunity of a ride round the house – she instinctively knew that the seat was for her and she sat comfortably, feet raised onto the rests ready for a quick spin round the house. We did a few quick runs, a few tight turns and then an unceremonious dismount but we were a go! I was surprised by the level of detail that had gone into the device even though I was very familiar with Mountain Buggy products given my adoration of the MB Terrain, our trail running and adventuring Buggy. The handle grip for the pilot is well considered and grippy – feeling more like a Vibram sole than a handle, the grip for the rider is soft and comfortable and the length of the device is perfect for both me and my partner (we just use it at slightly differing angles). The wheel which looks like it’s been lifted straight from the Urban Jungle Buggy is an air filled wheel which runs well on any surface – giving both good traction when necessary on say trail or ice but also moving speedily across smoother surfaces. 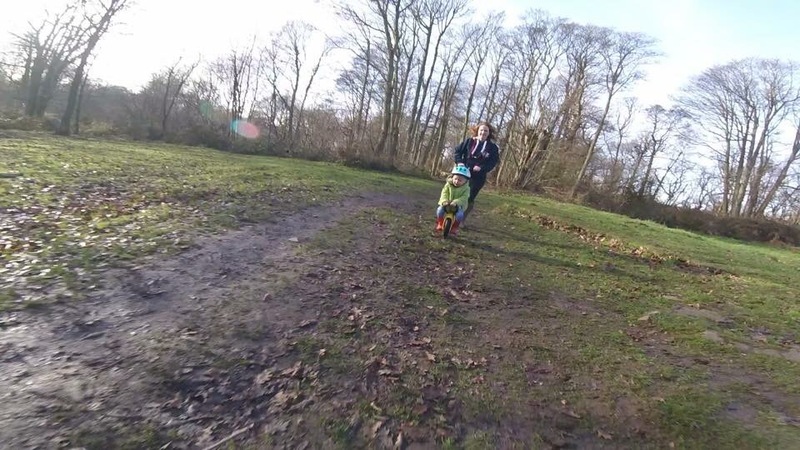 Second impressions: The big test for me though wasn’t bimbling round the house it was seeing how the Unirider would fare against a hilly, muddy trail run and also how would UltraBaby appreciate being unprotected by her buggy as she got much closer to nature? I need not have worried about the attitude of my adventure orientated child! I decided to start her at my local muddy dog walking trail, Ashenbank Woods. 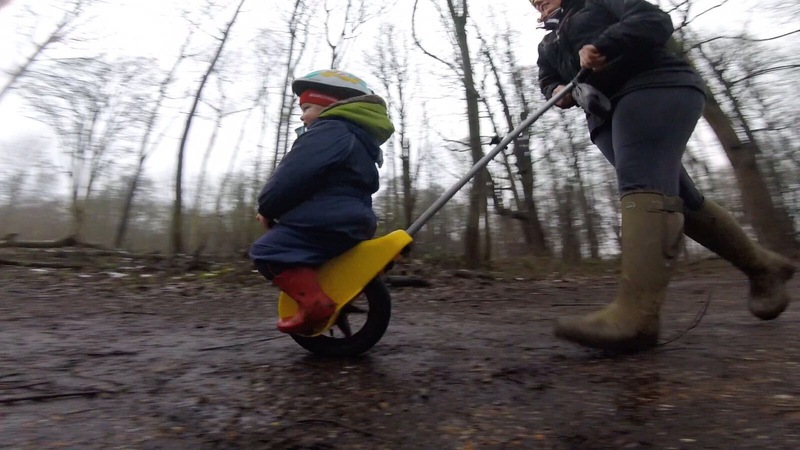 We’d built up a little excitement about using our ‘bike’. 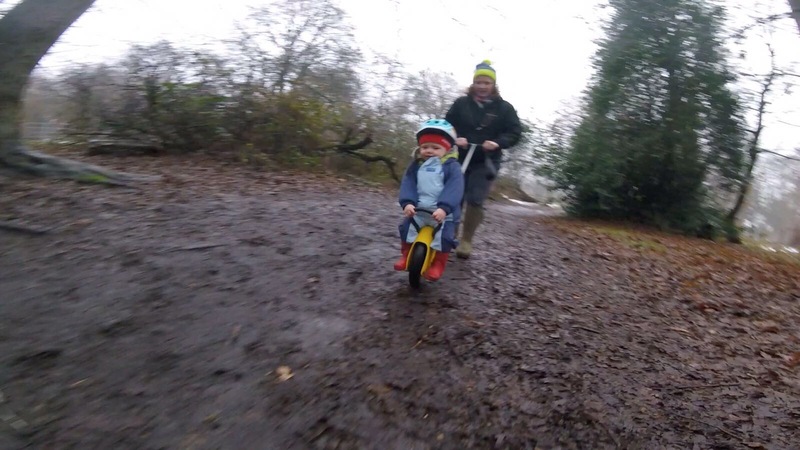 She placed her helmet on and once again climbed aboard the Unirider – this time we bounded off across the wet mud, leaping over roots, smashing through branches and undergrowth and generally having an awesome time. I was surprised how simple it was to pick up the running with the Unirider but how difficult it is to truly master, it takes a little bit of skill to assault a trail at full speed when you can’t pump your arms! 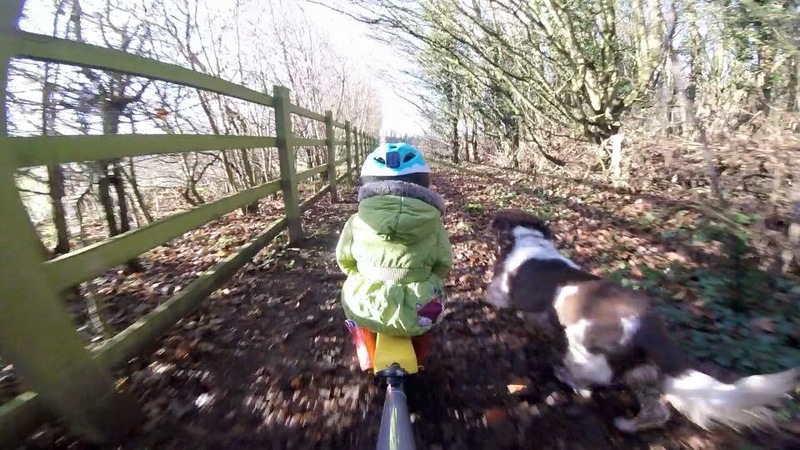 That’s not to say using the Unirider is difficult – because it’s not but there’s more to it than simply pushing – it requires a little bit of unison between you and your child, and that’s the key to really enjoying it. As we become more experienced… Running at my slower 5km speed (5min kilometre) up and down hills was hard but rewarding work and as the weeks have rolled on we’ve gotten significantly better and less exhausted! 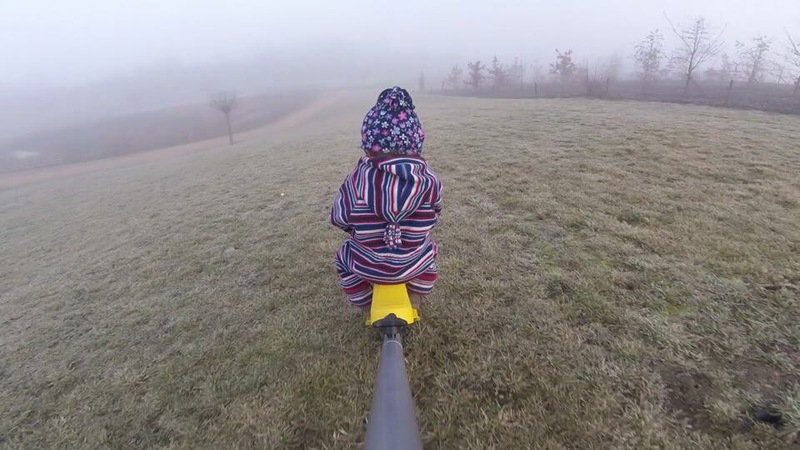 I’ve become rather adept at the one handed running, using a GoPro, answering the phone, etc and UltraBaby has really gotten to grips with leaning into the corners and adapting her weight for the terrain. It’s impressive watching her leaning back into the seat as we pour forwards downhill, my local BMX/dirt bike track has certainly seen some miles put in from us and UltraBaby never fails to impress in her rider role. Urban Jungle: With expanded usage we are also using the Unirider for more urban adventures such as trips to the shops and here it excels too, the length of the rider isn’t so long as to be intrusive in shops and the bright vibrant yellow offers a ‘howdly doodley’ to the oncoming human traffic. As I’ve said UltraBaby has learnt to lean into a turn and this I’ve found very helpful for urban cornering and rounding aisles in shops. Other considerations: Some might argue that the downside is that the rider can’t sleep when it’s in use but what I’ve found is that the quality of the sleep she has post ride is deeper and better. I’ve also found that UltraBaby enjoys the quick ‘off&on’ provided by the Unirider – when she wants off (be it in the urban environment or not) she simply asks and if appropriate we bob her forward and let her feet gently touch the ground before dismount. Quick, easy, comfortable, efficient and fun, the best words to describe a truly tremendous product. Distance covered: In the 7 weeks since we set the roads of Kent ablaze with the Unirider we’ve probably covered about 80-100 miles as we do use it mainly at the weekends or for when the GingaNinja is dog walking with UltraBaby (on a Thursday and Friday). 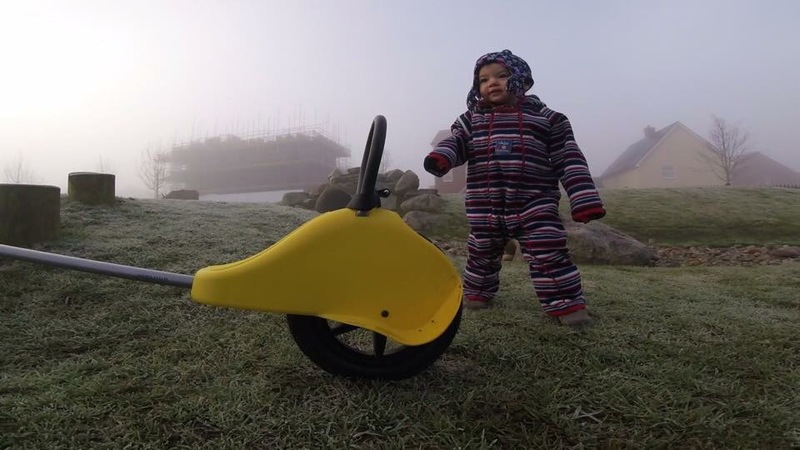 It’s unlikely to replace a buggy outright, especially in cases like mine, where the buggy is a conduit to more extreme sports but is a wonderful addition to our outdoor life. 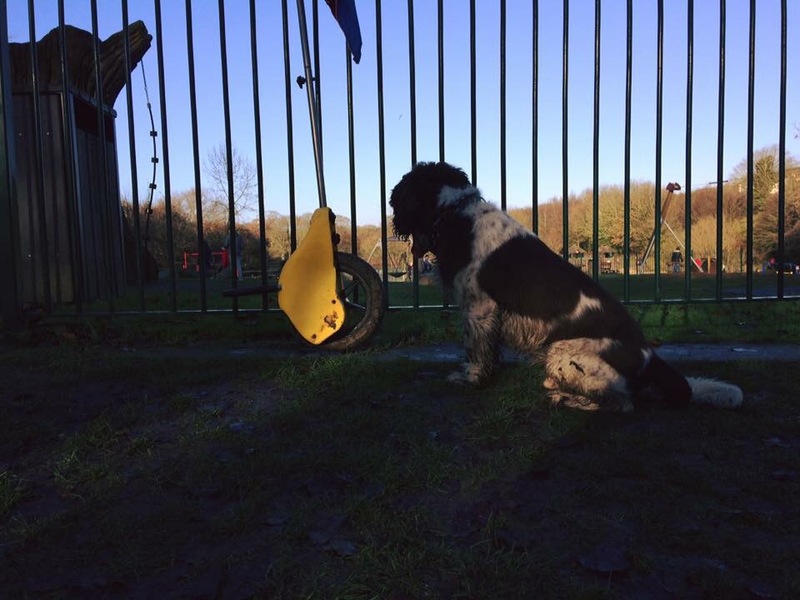 The important thing to remember though is that it shouldn’t curb their own desire to run and jump about. I very much see the Unirider as the thing we use to reach and extend adventure – not curtail it. I will often carry her scooter on my back so that she can whizz round under her own steam and then return to the safety of the Unirider later. Next steps: There are a few things we’d like to do with the Unirider over the next few months – as I’m returning to full fitness the Unirider gets ever easier and we are tackling further and further distance, so more of that methinks. However, we are likely to cap our (running) adventuring to about 10km, on the positive side thoughthere will be no limit to hiking adventures where she can ‘on&off’ as often as she likes. Parkrun will likely be a next target too and I wonder if the Unirider will be faster than the Mountain Buggy Terrain – we shall see. Other than that the Unirider will probably go to Barcelona and Madeira with us to allow for longer sightseeing options. 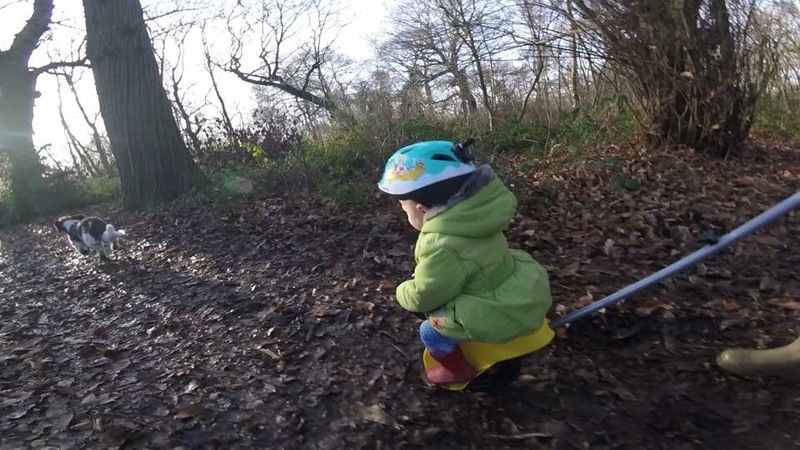 Conclusions: The Unirider is a thoughtful and well constructed device which is as much fun for parents as it is for your children. When it works at its best, pilot and rider act as though they have a symbiotic relationship. It is brilliant and with a reasonable price point. I have lots of love for Mountain Buggy kit and I’ll be sorry when UltraBaby finally outgrows their stuff but for the time being we are having the most fun possible – together! If you’re thinking of getting one you really won’t regret it. Check out the Mountain Buggy website for more information.